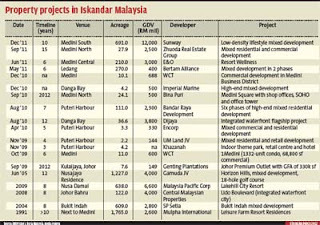 PETALING JAYA: With the spate of big-ticket projects being launched in and around Johor's Iskandar region, such as Iskandar Waterfront Holdings Bhd's RM80bil transformation of the coastline fronting Singapore, there are concerns that a glut could emerge in the state's property market down the line. Although an oversupply in the near term was unlikely, valuers and agents said it could materialise in a decade or later as the developments there would have a long gestation period. “It is a cyclical industry. There could be an oversupply but this will not be for another 10 years,” Zerin Properties chief executive officer Previn Singhe told StarBiz. Johor Baru-based V. Sivadas, executive director of PA International Property Consultants Sdn Bhd, pointed out that a glut was imminent if buying interest from Singapore, which has thus far led demand, dried up. “Malaysia's existing population will not be able to absorb all the new properties on their own,” he said. He noted that if the proposed high-speed rail between the two countries was fast-tracked, it could create an “instant demand” for Johor properties as the two existing highways linking Malaysia to the island state faced heavy congestion. Another crucial factor, he added, was for the authorities to craft a long-term asset policy that would not dampen interest from foreigners, yet prevent the kind of artificial inflation of prices caused by speculative buying. Last year, the Singapore government moved to cool its property market by imposing a 10% stamp duty on homes bought by foreigners, effectively raising the purchase price by 10%. Foreigners, spurred by low interest rates, had snapped up about 9,300 private homes there in 2011, making it a record 31% of all transactions. While a surfeit in residential properties may not be for some time, CB Richard Ellis (Johor) Sdn Bhd director Wee Soon Chit has some concerns about the service apartments sector. He said there had been a sudden increase in the supply of service apartments in Johor, which might not be consistent with demand. Sivadas also observed that service apartments were fetching between RM500 and RM600 psf now, their highest ever. 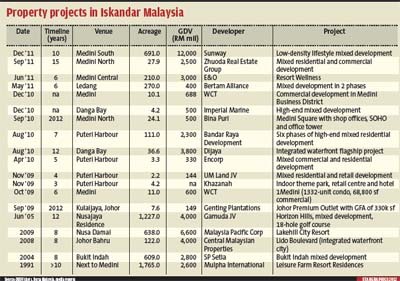 One thing is for sure the development of Iskandar has led to a marked appreciation in property prices in Malaysia's southernmost state. UEM Land Holdings Bhd's Imperia@Puteri Harbour, the group's first residential development there, has sold 152 units, or 65%, since its soft launch last September. Singaporeans bought 90 of these units. CIMB Research said in a report that the original selling price was RM545 psf, but this has risen to between RM700 and RM980 psf, which was a premium over the RM400-RM450 psf price for condominiums in neighbouring Kota Iskandar and Medini. “One of the semi-detached houses in East Ledang (also by UEM Land) sold for RM1.6mil. This is a new benchmark,” Wee said. Sivadas explained that all the new properties were priced above the RM400,000 level, and only the older homes could be bought for less than that. “The prudent investors have mostly purchased completed apartments. It is the speculators who are going after the new launches,” he said. However, he cautioned that Iskandar as a whole still had a long way to go. “It will take another 50 years for it to be fully realised. Even though there are lots of plans and it looks good on paper, implementation remains the key. “Various plans for Johor's development were unveiled years ago, but the Johor Baru skyline has not changed much. What has taken off is just a small percentage of what has been promised,” he said.